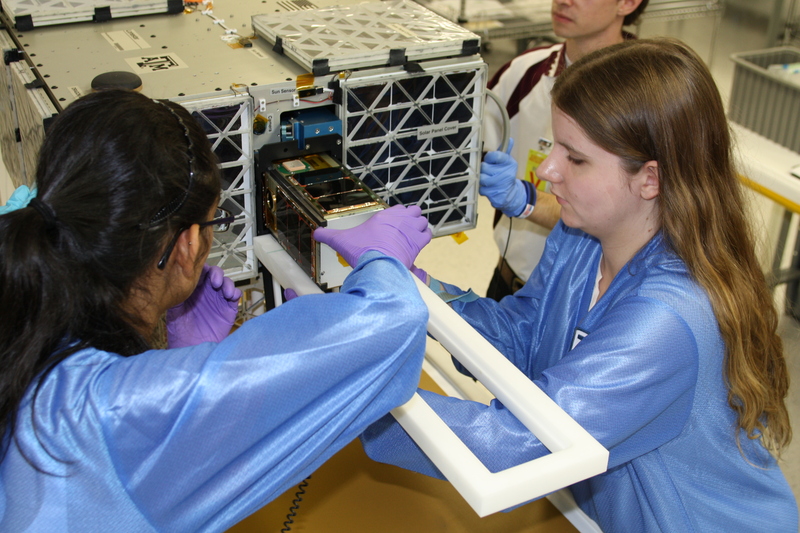 Dr Helen Reed KD7GPX is interviewed in a NASA story about the AggieSat4 and Bevo-2 satellites which were deployed from the International Space Station (ISS) on January 29, 2016. Students from Texas A&M University and The University of Texas came together for the LONESTAR investigation. This collaborative effort sent a pair of satellites, AggieSat4 and Bevo-2, to the International Space Station. The satellites were deployed from the space station on January 29, and AggieSat4 will eject Bevo-2 as part of a demonstration of technology with applications for future space exploration. The two satellites will demonstrate communication protocols between them and with ground stations, as well as systems that allow the satellites to navigate through space and relative to each other and to orient themselves in three dimensions. Flight demonstration of these abilities, necessary for unmanned craft to be able to rendezvous and dock in space without direct human intervention, will contribute to future satellite missions as well. Small satellites are less expensive to build and investigators can more easily find space on rocket launches to send them into orbit, but it does take creative thinking to design a functioning satellite with smaller volume and less power. Bevo-2 is 13.3 inches long, 5.3 inches high and 5.3 inches wide, about the size of a loaf of bread. AggieSat4 measures 24 by 24 by 12 inches, slightly larger than a piece of carry-on luggage. Together the satellites weigh 114 pounds. The AggieSat4 team request that any amateur radio enthusiasts receiving the beacons sends any data to aggiesat@tamu.edu it would be much appreciated!